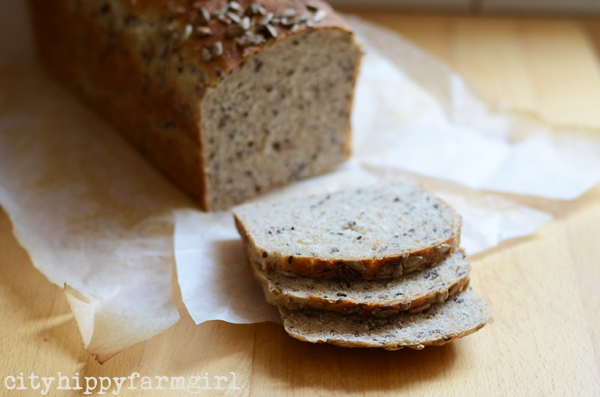 This entry was posted in Baking Bread and tagged baking, bread, recipe, simple, sourdough, wild yeast by cityhippyfarmgirl. Bookmark the permalink. Glad you got your bread mojo back Brydie! That loaf looks amazing – I can almost smell it from Melbourne! Thanks Keri. I can happily say…it’s good to be back! That looks so, SO good Brydie, and I still think a dud home-made loaf is far superior to a bought loaf any day! Gorgeous photos. 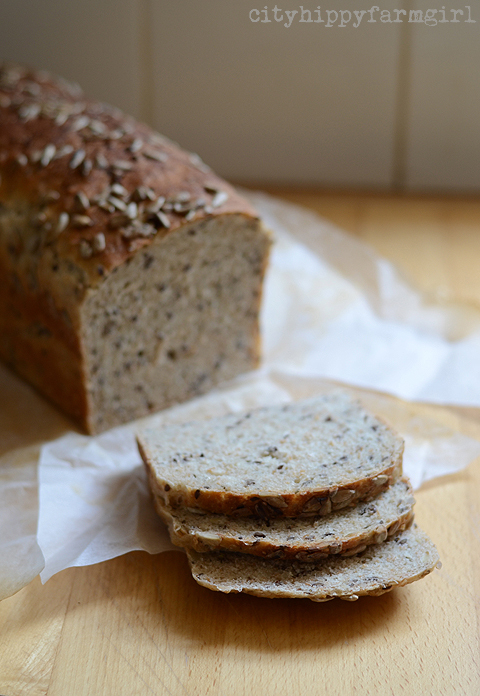 Dark malt flour sounds lovely – haven’t come across that before. The dark malt flour is a little packet, lasts for ages and it really is just a look thing. (Doesn’t impart any particular taste.) Definitely helps with the colour of the dough though. Thanks for sharing these moments : ) I find it just as useful and inspiring as your regular beautifully captured and successful endeavors! Yes, forgetting the salt is a real pain. Dousing it with vegemite is the only real option! Distraction does not make for good bread. I have been having on and off experiences for the same reasons- although my plain yeast breads were good- the sourdough were bad performers. I’m blaming it on the sourdough starter and starting over, thanks to Celia! You are so honest about your failures Brydie and encouraging for that reason. Thank you! Distraction really doesn’t work does it. My best loaves are always the ones where I’ve done it mindfully every step of the way. It can still be quick, but multi tasking many things leads to marginal loaves…and who wants to eat them! Now, lovely, I have a sourdough starter qn for you…I have been terribly neglectful of mine of late (his name is Pepe, long story! ), and will need to revive him with some love this weekend before it’s too late. He’s always been a rye starter through and through, never fed him anything else, and I’d like to tone down the ‘ryeness’ in the breads I’m baking (because they always end up waaaay tangy and abit too flat). Do you think I could gradually introduce white flour into the feeds by mixing it with rye and then gradually tapering the rye off? Becs, I’d say just dump it in, (in a respectful bready way of course.) You could still use rye for the rest of loaves when putting the dough together but your starter could be a regular white flour one which would probably give it a little more oomph. I haven’t played with a 100% rye for a long time as wholemeal spelt kind of moved in, but I’d say give it a crack. Just for a month or so Jane. You’re right. Those 100% happy with them loaves carry over for when the loaves aren’t so crash hot. Have a wonderful weekend Jane. 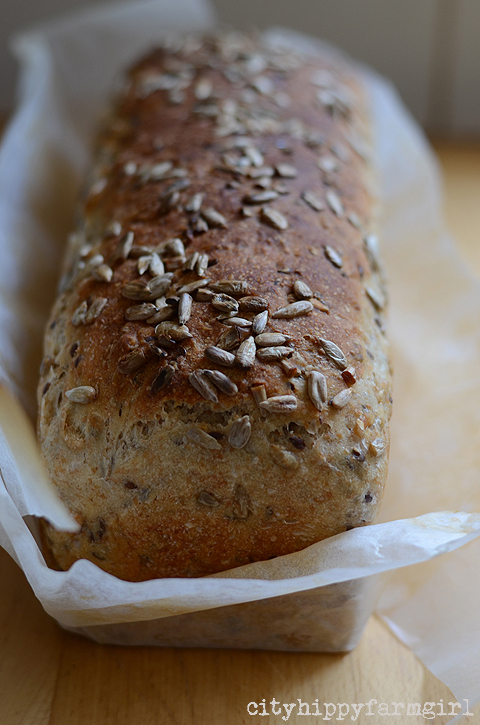 Agree – homemade bread is the best. I have had kombucha in my fridge for a couple of months now and I still haven’t summoned up the courage to do something about it…must do! Tell me, have you ever come across any comparison with the health benefits of kombucha, kefir or ginger beer? I make ginger beer with a reduced amount of sugar (1 cup about 3 litres) and have often wondered how it compares health wise to the other two? This loaf looks fabulous! I love the seeds. My loaves are coming along beautifully at the moment and I have managed to get 3 friends into making sourdough. Yum. OMG – Brydie; I think you’ve found your calling. Making Bread. It looks perfect. I lost my sourdough mojo in the last month and am teaching a workshop this weekend!!! Starter is such a funny thing, I think I damaged mine by putting it into a new clean jar, which maybe had residual soap? thankfully i’d given starter to a friend a year ago who has never ceased turning out spectacular loaves, so she topped me up and we’re all good again. this look really yummy! but i have never been able to do bread, they become this stone-like object, which miraculously still happen to taste nice if i can manage to bit through them.